Outside Oslo is now available! News! My new fabric line has just arrived at The Needle Shop and is available for purchase retail and wholesale. The bolts are eagerly standing by, holding their breath in hopes that some kind and discerning people like yourselves will give them a good home. Guys, I'm in love with these. I can't even decide which is my favorite. 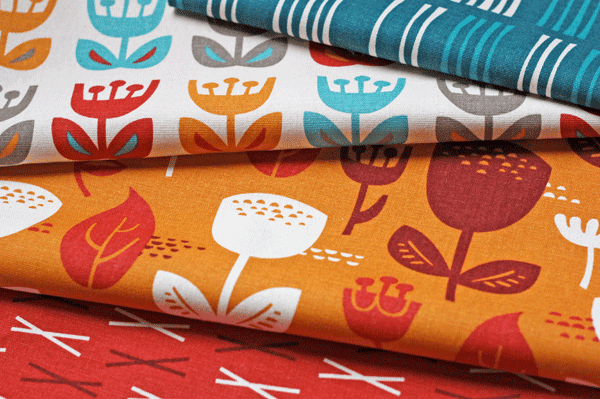 I'm leaning toward the Wildflower print in Dawn, above, just because it contains maximum orange. But I think they're all delicious and one should not discriminate amongst one's children. The set of six Dawn designs are printed on natural canvas, so the backgrounds are sort of a cream color and contain cool little cotton flecks. The Dusk designs are printed on crisp white. Why is this collection named Outside Oslo, you ask? 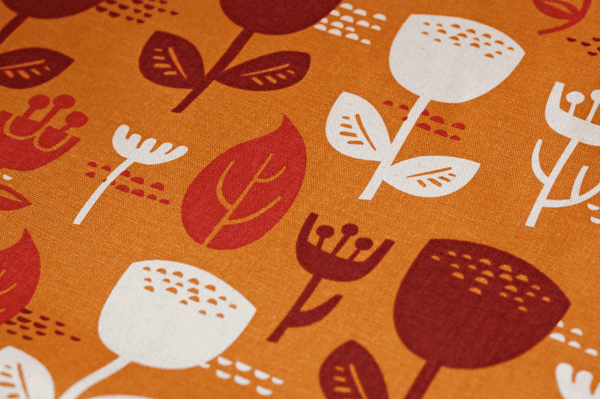 These prints have a bit of a mid-century vibe and look somewhat Scandinavian to me. Relatives on my mom's side of the family came from Norway. The prints are all named after things you might see on a nature walk somewhere outside a city, and I always adore alliteration. Thus, Outside Oslo. Above is the complete Dawn colorway. And above is the complete Dusk colorway. You can now buy these from The Needle Shop online right here or in the store if you're in Chicago. For a list of stockists around the country, plus a few international shops, click here. And if you know of a store or manufacturer who might be interested in a wholesale order, send them here. I can't wait to see what people make with these! 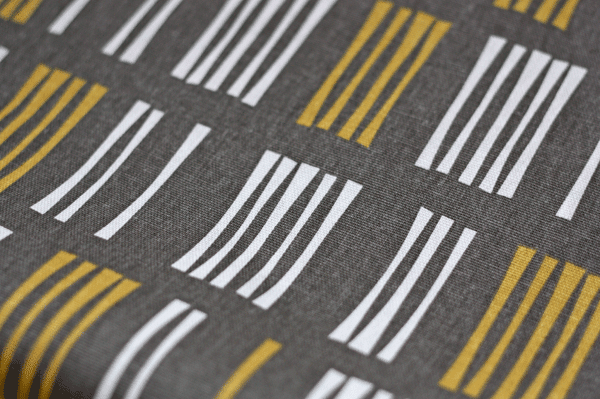 Update: For some peeks at the fabric in action, see here. So gorgeous. I need the whole dusk collection! I love! Birthday money, here you go again! congrats! I need to go and use my groupon. I'm afraid I will want too many pretty things when I get there! It's great that you "adore alliteration!" I can't decide which is my favorite either. That's why I will get a little of each and see where it takes me! 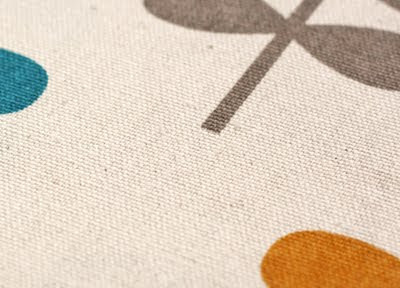 I was thinking of making a tablecloth for my patio table, would this fabric be okay for outdoors? Sorry if it's a silly question, I know next to nothing about fabrics! Congrats! What gorgeous fabrics. Oh, so many choices to look forward to. I'm actually taking a class this weekend at The Needle Shop and will look for your fabrics. I love love the design and colors! AND I need to reupholster my chairs. Woohoo! Now which one shall I choose? Mum is ever-so-proud once again!! And I can't wait to get my hands on some of it myself! @Nick, this would be great for a table cloth! I wouldn't leave it in the rain for a week, or anything, but just use as you would any table cloth. There are some great stain repellent products these days as well. Congratulations! What a beautiful line! I'm looking forward to owning a few of these beauties! Congratulations! It's a charming collection. I love the Dawn colorway's cheeky oranges, reds and turquoise. I have curtains made out of your blue leaflet print and look forward to using these fabrics. Love the simplicity of your prints. How wonderful! You must be excited! Absolutely gorgeous!!! I wish I wasn't a poor graduate student or else I would buy AT LEAST a yard of EACH! :D Congrats! Super cute range! Congrats on the release and for starting up a new biz with The Needle Shop. May this be the first of many. beautiful, beautiful, beautiful. you must really very chuffed! Love it! I have lots of uses for these! These make me so happy! They are gorgeous! These are awesome! I love them! I want them all! I love both sets! So much fun. I think some of these beauties will be making an appearance in our new home! Awesome designs! Totally, totally, totally FAB! I see a complete redecoration of my sewing room in my future. I think the dusk collection is just fabulous. I am updating a large home and will do an entire room around this colorway. Oh my goodness...I LOVE the Dusk colorway. Actually, I am fibbing...I LOVE all of them. Could I ask a question about the dusk - is this a mustard color? My monitor can be a bit persnickety. Thank you for the great collection. Ooooooo--how retro modern and pretty. Any chance of quilter's cotton comming down the line? I would love to design some girls dresses using these patterns. Not that I know of, Anna. But maybe some day! That helps tremendously. Thank you so very much!! I love them! Are they heavy enough for curtains (with a lining of calico to protect from the sun)? I love the bright orange ones, they would be perfect for curtains! great fabric! I love those colours! is the needleshop by any chance also delivering to europe???? Nice patterns, and beautiful colours! Rie, these would be great for curtains. They're heavier than quilt-weight cotton. Nicestuff, I'm pretty sure The Needle Shop will deliver to Europe. International shipping always costs an arm and a leg, but I'm sure they'll try to do their best to make it as affordable as possible. Torirot, you made me laugh. :) Thank you. 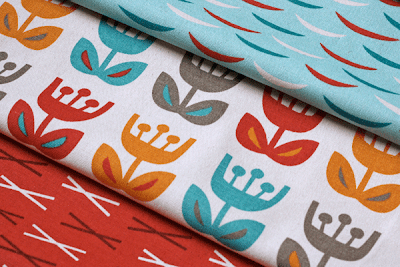 We can ship Jess' fabrics, 4 yards for $5 domestic and $13.25 international! Is the blue in Dusk Wildflowers teal or turqoise or...? Do you happen to have a paint color that it corresponds to? I'm planning on refinishing a dresser to match the curtains that I now MUST make in this fabric. omg i want them all! I would LOVE to make things that pepper my apartment with these designs. Beautiful! We are soon to redecorate the kids room, of which a boy and a girl share. I want to make each a book sling and a pillowcase. Definitely a boy and a girl fabric, but yet coordinating with each other and tan walls. Definitely will consider this line of fabric! I would like to put in a plea for you to do a quilting cotton weight some day. I would seriously LOVE to make a blanket out of your fabrics. @Holly, the blue in Wildflower - Dusk is Sherwin Williams "Freshwater" (6774). Fantastic collection, absolutely lovely! I love them all!! I went to The Needle Shop on Saturday and looked over all of them. They are fantastic and I'm going to buy the white background with flowers to make a cover for my orange Kitchenaid mixer! @Jane, we did the best we could considering the cotton shortage. Cotton prices are through the roof right now! "and I always adore alliteration". Love it! I love these fabrics, also. Great work! I'm such a fool for patterns, the only things my stash is missing are SOLIDS. Le sigh. But with patterns this great, I guess I'll just have to buy boring solids on an as-needed basis. Having just painted my soon-to-be workspace ORANGE, I have been looking for fabrics to utilize in the room, to accent, but not overpower...I now officially have my eye on two of your fabrics that I think would do perfectly! Thanks to Carissa Rogers for sharing! I live in Wisconsin. I just found your blog out of the blue, and discovered the Outside Oslo collection. I completely fell in love with the Picket - Dawn fabric, and had to go and get it....so I did :D brought back 3 yards of teal goodness for my next upholstery project. I just bought some for myself and you have NO idea how excited I am for the mailman to deliver them! I got the Outside Oslo Frond and Tulip in the brighter colors... I never realized I was a Scan design fan until I looked around the fabrics at my home lately and discovered they are all folky-ish in some capacity... Oh your fabric is going to be the star of my living room! I ordered a yard of the orange oslo fabric to cover a bulletin board! Love it! Jessica! These prints are amazing. Did you print them yourself? Wow. 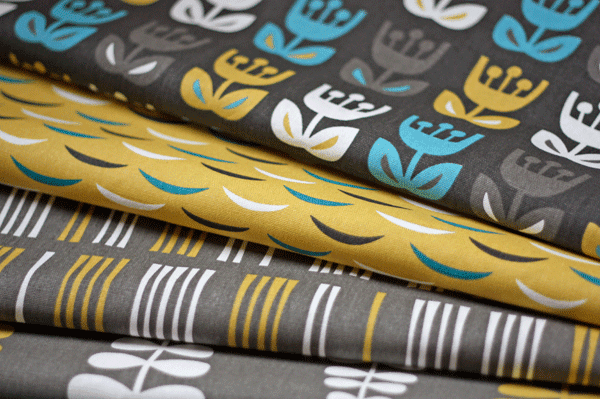 I bought the gray with the yellowish-orange and white fern shapes and it will soon be curtains in my dining room! I love your style! The best to you with your new line! Wow - I just found you via something random on Pinterest, looked at your etsy shop and realised that I have some of your fabric in my (actually quite small, but getting bigger!) stash! How fabbo is that? Cool! That's fun to hear!